Your four tires are the only part of your car that touches the road. Many auto experts claim tires are the most important safety feature on your car. Many stranded motorists will agree that you can’t go anywhere on three tires. Aside from the cost that can arise if you get into an accident or have a blowout, a set of tires can put a dent in your wallet. Protect your investment with proper tire maintenance. Caring for your tires involves a little knowledge and a little work. Knowing a few things can keep you safely on the road for the maximum life of your tires. Tire Pressure – Almost all tire care experts will tell you this is the first and most important piece of tire maintenance. Your car’s owner’s manual will tell you what proper inflation is for your car. Over inflation and under inflation can cause undue wear on your tires. Cars.com lists several drawbacks to improperly inflated tires. While checking tire pressure, be sure to give each of your tires a visual inspection. Tread – A good surface is crucial for stopping, and for control in rainy or snowy conditions. A quarter or penny test can tell you if have the minimum tread required for safe driving. 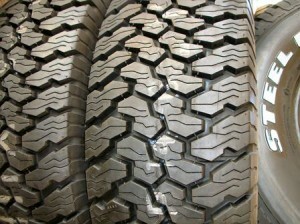 If you check regularly, you will know when the tread is beginning to wear down and be able to plan for replacement. Be sure to check the tread on all four tires, even if your car is a two-wheel-drive car. Balance – Uneven wear on your tires can cause your car to “pull” to one side, or to vibrate unusually. These can be signs that your car is out of alignment, your wheels are out of balance, or that your tires need to be rotated. Pay attention to the steering and feel of your car, and get it checked out when something seems off. In addition to the above, make sure you get the size of tires recommended for your make and model. For an easy-to-digest rundown of tire maintenance, check out AAA’s tire maintenance brochure.